Aluminum Panels Set To Take On Pollution As 'Smog Eaters' : Shots - Health News The aluminum giant Alcoa wants to fight smog with a new building product. The company says its panels clean the air as well as trees, but research suggests trees can remove some pollutants the panels can't. Can building exteriors really eat smog in cities like Los Angeles, pictured here? In the witch's brew of gases and particles that make up smog in most cities, nitrogen oxides are a plentiful ingredient. 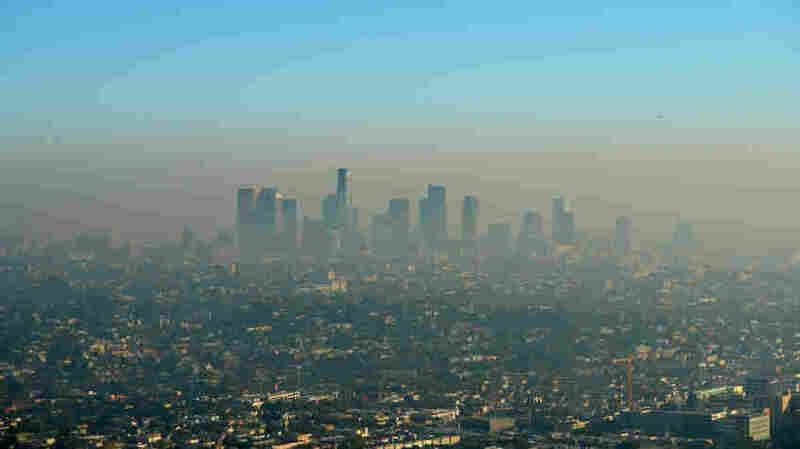 The pollutants also help create ground-level ozone, a nasty irritant for lungs, and bothersome fine particles. The family of chemicals, called NOx in shorthand, can inflame people's airways and trigger asthma attacks, according to the U.S. Environmental Protection Agency. Reducing emissions is one way to curb NOx pollution. But aluminum giant Alcoa has another idea for taking on NOx: a building panel with an special coating, called EcoClean, that the company says can turn buildings into smog eaters. The secret weapon against smog? Titanium dioxide. Used to coat Alcoa's aluminum panels, the material can neutralize harmful pollutants through simple oxidation. When sunlight strikes the titanium dioxide, its electrons transfer energy to oxygen and water in the air, creating free radicals. Alcoa says these free radicals then oxidize NOx molecules, and they'll eventually wash away as nitrate. Alcoa had panels tested by an independent firm in Georgia, and the results "confirm that on a molecular level EcoClean neutralizes smog." The panels aren't on the market yet, but they're expected to cost 4 percent to 5 percent more than conventional aluminum panels. The company says that 10,000 square feet of its panels "has the approximate air cleansing power of 80 trees." The European marketing tagline even asks: "How much forest can I build?" That may be overstating the case a tad. EcoClean may remove a lot of NOx (and other oxidizable compounds) from the air. But air pollution is complex stuff. Now, Alcoa isn't saying that the panels should replace trees. And spokeswoman Libby Archell tells Shots the company plans to plant 10 million trees worldwide by 2020. Ultimately, though, the environmental impact of its new product will depend on how many people buy and install it. And Jason West, a professor of environmental sciences and engineering at the University of North Carolina, tells Shots that most of the serious work to fight NOx emissions is happening at the source, trying to prevent them in the first place, not when they're already in the air. Still, Alcoa's product, and a number of other smog-fighting materials in the works, probably won't hurt — as long as you don't have to uproot too many trees to make way for your building.